Narcissistic abuse is one of the most deadly and disgusting real-life horror stories that anyone could go through. It triggers such feelings of powerlessness, rage, betrayal, devastation and shock that we wonder how we are going to stay vertical and breathing, let alone get through it. How on earth could you feel peace after what happened to you? I discovered how powerful the key component of PEACE is in narcissistic abuse recovery, how to embody it, become it, and how this not only rendered the narcissist powerless against me but also kicked my life off into a rebuild of abundance and wellness that surpassed my wildest and most sought after dreams. This is why I am DARING To bring you the information regarding PEACE in this Thriver TV episode because I know it is a ground-breaking healing key for you too. I remember many years ago when I went online and tried to get support from other people suffering from narcissistic abuse. I discovered I was entering something akin to a battlefield; injured people screaming in agony everywhere. Peace certainly wasn’t a thing. It seemed like no one had it, and much less knew how to get it. Peace wasn’t a priority, even though I’m sure everyone deeply wanted it. Instead, people were sharing their war stories with each other, getting angrier and more devastated about what narcissists had done to them. In today’s Thriver TV episode, I want to talk to you about PEACE, and how it is the number 1 commodity to go for, as well as how when you make peace ‘everything’, then everything else will follow. I am also going to help you know how to achieve it, after narcissistic abuse, regardless of who the narcissist is in your life is, and even if you can’t go No Contact with this person. It’s because, at Quantum Reality, everything in your outer Universe is responding to your Inner Universe. When we start awakening to this, we know our inner emotional state is exactly the template for how our outer life will go. The old beliefs we had as humans are: ‘If I change what is going on outside of me then how I feel on the inside will change’. Wrong-town! This is especially flawed when dealing with narcissists. If you try to battle them from an inner place of devastation, heartbreak and white-hot fear, then what the narcissist will dish up to you is even greater abuse, providing more of these inner states. When we become conscious, we know that we are self-generative Beings, and IF we achieve peace on the inside, then narcissists start to lose their power over us. We are no longer triggered. We respond in ways that don’t feed them energy, or we refuse to respond at all. We take calm action against what the narcissist is trying to do, or just let the attempt melt away on its own accord. We can lay clear solid boundaries where necessary and stop trying to appease the narcissist, strike a deal and keep them ‘sane’ (which only allows them to abuse and take from us more), because we are no longer giving in to their disordered threats, demands, accusations and grandstanding. We also start to experience from all of Life, connected to this situation, the RIGHT people showing up to grant more of the peace that we have established on the inside. We find that as a result of taking care of and supporting our own emotional state and bringing it to peace, that life and others start to support us as well. It seems like a miracle, but it’s not. It’s simply Quantum Law, so within, so without. Before you say, “Melanie here is this new-age woohoo crap that is not logical!” I really invite you to not take my word for it. Instead look deeply at your own life and be honest with yourself. From fixing a household item to a disagreement with anyone, were the results favourable when you felt agitated and out of sorts? No! It was only when you calmed down (went for peace before the issue was solved) that you got real results. Neuroscientists are now proving that when we are in emotional trauma we don’t have access to the part of our brain required for solutions. They also believe that there is no access to thoughts or The Field (unfoldings) that are of a healthier version than that of the trauma. The bottom line is, I personally don’t care what proof there is, or what I could be researching. To me truly that’s all a waste of time, but be my guest if you wish! My suggestion is, rather, simply start making ‘peace’ your priory before outer events shift and then see them shift, sometimes instantly… and you will be living the truth of this Quantum Law, and THEN you will believe it. If you want to experience what I’m saying and if this resonates with you, I’m running a workshop this week that will help you with releasing the traumas that are not allowing you to feel inner peace. You can register for the next available workshop by clicking here. I want to explain to you what establishing peace in the face of trauma ISN’T. Giving up and giving in. Condoning and allowing someone’s poor behaviour. Bringing one’s power back to self (this is the only place it resides). Aligning with and creating your healthy life regardless of what someone else or isn’t trying to do to you. Caring about your life and your application to it, as well as what is true and real, in profound and powerful ways. Interestingly, a lack of inner peace (having the trauma remain within) creates the very opposite of the results we want (ironically which is, of course, is resolution and then inner peace). This is because the feelings and thoughts of needing accountability and justice and not being able to feel any peace unless this happens, only mean more victimisation and lack of closure keeps happening. How interesting it is, in the way the human experience has been set up (which we all missed because we weren’t taught it) that the state, the feeling of ‘peace’, must proceed the events that bring peace. It’s not the other way around, and this is why we need to go for the peaceful emotion first. What Does Peace Really Mean? It means this no longer triggers me. It means no matter what my outer life looks like, and what is going on, I am connected to myself peacefully. I’m in acceptance that all of this is unfolding perfectly for my highest good and greatest self, and I am safe. This means not being attached to any particular outcome at all. This means not needing any particular outcome to occur in order to be peaceful because you already are. I know getting there is a BIG CALL after narcissistic abuse. MASSIVE! If you had told me to ‘just be like this’ after narcissistic abuse, I probably wouldn’t have been responsible for the swear words I would have said to you. Fortunately, you know that I have been through it and that I too was at the brink of total destruction from this, and I came back. The reason is: because I know how to go for and ‘be peaceful’ under every circumstance now. And since doing this, finally, for the first time in lifetimes, my life has filled with abundance and joy, and my life works. Whereas before it never did. The one simple formula I have that creates this with every topic in my life that hurts me, confuses me, or challenges me, is: I do Quanta Freedom Healing on it. I release all associated trauma and painful beliefs out of my inner being on that topic and bring in my superconscious self which KNOWS what to generate and do for my highest best. Then I think, feel and operate in healthy ways on that topic, because I am at peace about it. That’s it! That’s what I do! So, now that I hope I’ve inspired you to get to peace no matter what, I really hope I can answer some of the burning questions that you may have. 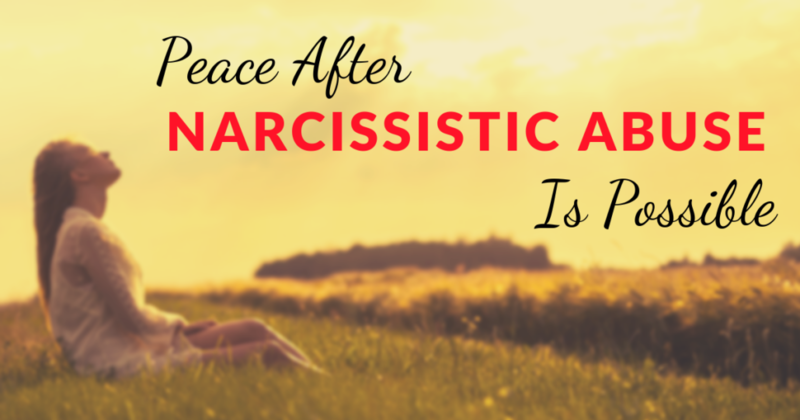 How To Get Peace When Enmeshed With A Narcissist? You may still be living with a narcissist, working with one, running into a family narcissist at gatherings, or have one as a neighbour. And of course parallel-parenting with one. You may have heard everywhere how vital No Contact is and how it is so hard to heal without it. This is where Modified Contact comes in, which is about detaching as much as possible and not granting any emotional energy to the narcissist at all, regardless of how much he or she tries to trigger you by baiting you with insults, threats, bad behaviour or parading new supply in your face. Absolutely, having the narcissist still in your face takes things to another level, yet please know after the psychic vandalization of narcissistic abuse, even if you never see the narcissist ever again, he or she is living on inside you anyway. You are not free of the narcissist, at all, until you learn what I am about to tell you, which is the ‘peace component’. The only way to get peace is this: Resolve everything within yourself that the narcissist triggers. So, this is the deal, rather than latching onto trying to belt the narcissist around the ears to get ourselves to a state of peace, we go inwards, find the associated triggered trauma, release it and bring peace in instead. Then truly, what the narcissist is saying to you and trying to do to you becomes as insignificant as a slug that you just stepped over on the pavement and continued walking past. Yes, the narcissist may pop, and up the ante. But then calmly and clearly you report any threats or physical acts and mean it. No more are you going to get shoved around. You are not buying into abuse, you refuse to participate with it, and you will not tolerate it. When you become ‘anti-fear’ and embody peace and strength, wait and see how powerless the narcissist becomes. Naturally, getting away from abuse and not having abusive people in your life is the goal. Then this level of powerful, peaceful detachment creates the space to get your new life started, look for another profession or know that now this family member can only approach you with respect, or you grant them nothing anymore. Profound huh? And profoundly true. You just have to live it to find out. I know with all my heart how terrible it has been for many of you suffering such losses, including possibly the custody of your children. Things that are so beyond painful that it seems impossible to reach a state of peace. I talk about, in my free Quanta Freedom Healing workshop, how Dot in her 70s had not seen her children or her grandchildren for 32 years because of a narcissistic ex-husband alienating them for her. After working NARP Modules, and releasing the unspeakable trauma about this, which had haunted Dot her whole life, her estranged son contacted her out of the blue, and now she is connected to all her family lovingly. Was this a coincidence? No. What happened was finally Dot reached peace with ‘what is’ on that topic, and then it could shift. The same happens when we have health and financial devastations with narcissists. Myself and so many Thrivers, who were burning in hell in the horrific traumatisation of losing everything we had worked years of our life for, and then suffered the added injury of being unable to rebuild because of our health, experienced incredible and miraculous healing and reinstating of wellness when we released our trauma and came to peace with ‘what is’ on these topics. Okay, I hope that this has inspired you, even in the face of the most horrible pain and circumstances that there is hope. In fact, I want to hold your hand and take you through an actual shift that releases trauma and grants you peace and a shift right now (or as soon as there is a time convenient for you). Please join me in my free workshop and we will go through a Quanta Freedom Healing together which has allowed myself and so many others worldwide, establish peace, healing, and resurrection where nothing else has worked. Click here to sign up for the next available workshop.